Daniela Majic's latest series boasts gorgeous and dreamlike garden photography. 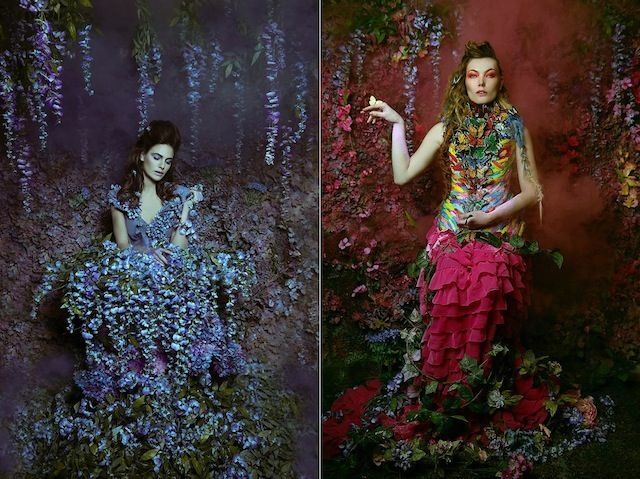 Her botanical portraits feature opulently dressed models and are incredibly feminine in their air. Whether capturing sublime or dramatic scenes, the Canadian photographer illustrates her signature style through her dynamic works. Her garden photography is fashionable and fairy tale themed, drawing a viewer in with its bold visuals and expressive use of color. Titled "Secret Gardens", this series by Daniela Majic features vivid flower beds and forest imagery that is both moody and imaginative. In addition to capturing these gorgeous photographs, Daniela also staged her own floral garden backdrops and hand-selected each of this series' botanical costumes and statement accessories. Overall, her work draws inspiration from dreamlike imagery and will appeal to fans of fantastical or surreal art.